BitTag, from digital designer Samuel Cox, is a smart price tag that displays an item’s up-to-the-minute value, and enables mobile payments in Bitcoins. Each tag runs on a rechargeable lithium-polymer battery and uses Bluetooth Low Energy to retrieve the item’s realtime Bitcoin price (based on a fixed dollar value), which is shown on a small OLED display. An iPad app makes configuring the tags easy — just place one on the screen to adjust its settings and generate a QR code. 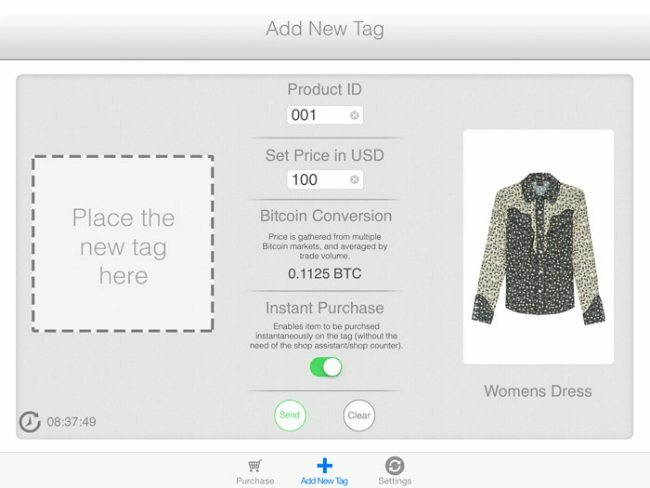 Customers can also simply shake the tag to make it display the QR code, which can be scanned into a Bitcoin wallet app to initiate a payment for the item on the spot. The distributed digital currency is having some growing pains recently, with governments struggling with regulation, Apple cleansing its app store of any traces, and the real-world value of Bitcoins still experiencing major volatility swings. But many, including Cox, continue to believe that Bitcoin will overcome these roadblocks and define the future of economic transactions. BitTag is still in prototype stages, so the app is not yet available. Cox says he feels confident it will pass through Apple’s approval process, because it’s neither a wallet nor payment processor, only a way to communicate with the BitTag hardware. Luckily, Google seems quite open to Bitcoin and many wallet apps remain available for Android devices. To learn more and register for updates on the project, visit BitTag.net, or you can check out the rest of Cox’s portfolio of networked projects atSamuelCox.net. IoT & Blockchain, what's next?